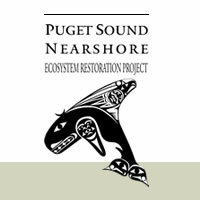 The Puget Sound Nearshore Ecosystem Restoration Project (PSNERP) works to assess the health of Puget Sound nearshore environments and provides strategies for their protection and restoration. Recommend a series of actions and projects that have a federal interest and are supported by a local entity willing to provide the necessary items of local cooperation. Once recommendations have been made, they will be included in a report to Congress requesting authorization to implement the recommendations. PSNERP teams initially worked to gather the data necessary to develop the science to support the study. By 2009, study and analysis of the Puget Sound nearshore was largely complete. Using the results of the technical information and analyses, PSNERP can identify locations within Puget Sound as good places to do process-based nearshore restoration work.